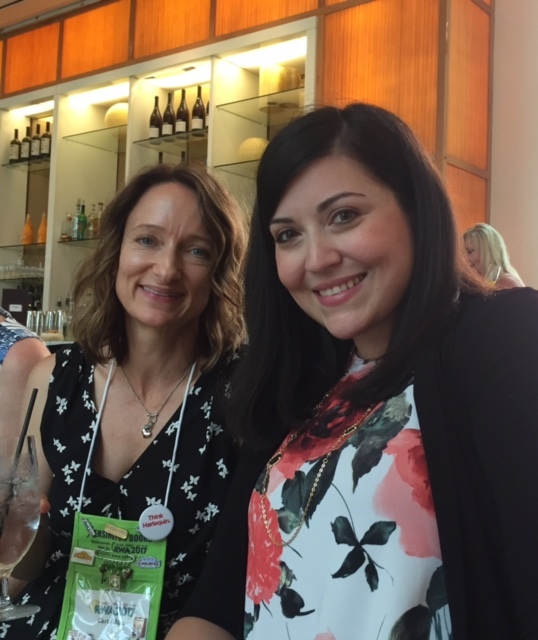 We're back from the 2017 Romance Writers of America annual conference and we have tons of photos to share (seriously)! 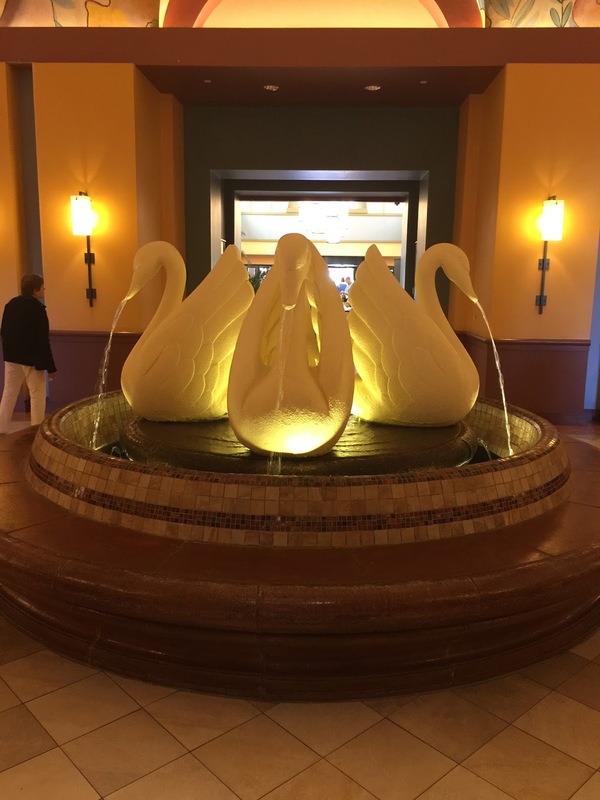 This year's conference in Orlando, Florida was upbeat and fun, from the sunshine and palm trees at the Swan and Dolphin Resort to the fantastic workshops and, of course, to the phenomenal and renowned Harlequin Party! Fabulous editor Claire Caldwell, Rula Sinara and Catherine Lanigan at the Harlequin Party. We love you, Claire! Don't get us wrong. It wasn't all play! 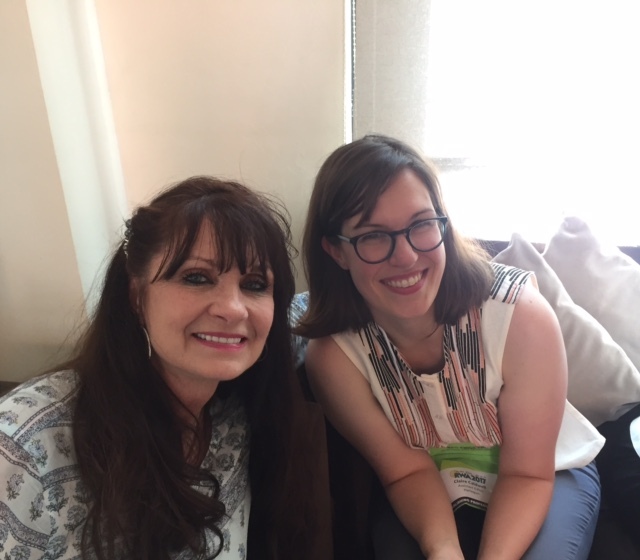 The annual conference is packed with workshops for writers at all stages, editor/agent appointments and opportunities to meet with readers and librarians. We went to many sessions, shared notes with other authors and tried to cover as many bases as we could. It's a lot of information to absorb in just a few days, but so worth it. 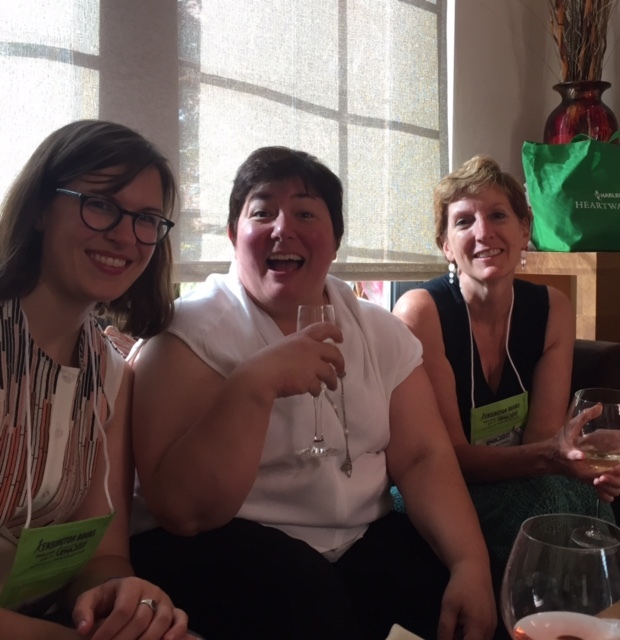 We applaud and thank RWA, the editors/publishers, speakers and volunteers for all the hard work they put into making this conference such a success. So let's back up and start with one of the most exciting parts of the conference...the Harlequin Heartwarming authors and editors reuniting for hugs and laughs. Some of us were meeting for the first time in person! 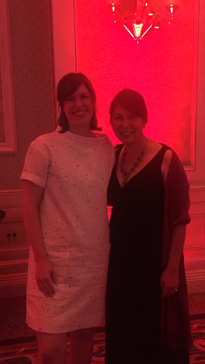 Catherine Lanigan & our extraordinary, brilliant editor Claire Caldwell. We both think she's pretty too :). 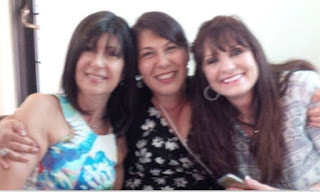 Kate James, Rula and Catherine (sorry the pic is blurry, but we still love it). Can you tell we're having fun? 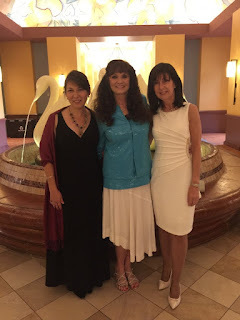 Awesome editors Claire Caldwell, Kathryn Lye and Heartwarming author Melinda Curtis. Note: Editors Kathleen Scheibling and Johanna Raisanen were also there but somehow we didn't have photos to post. We love you too! 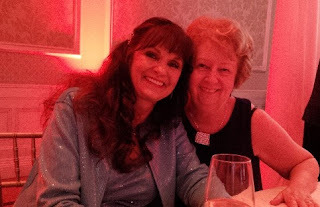 Carol Ross and Laurie Tomlinson...both adorable. 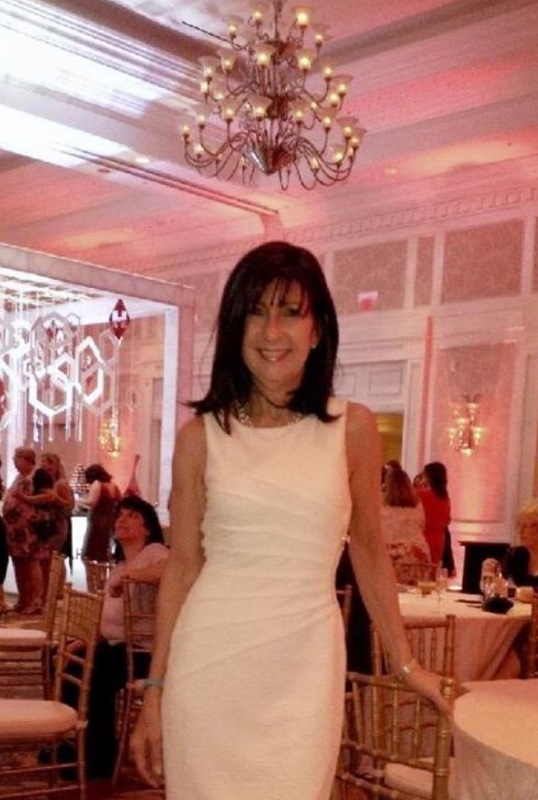 Amy Vastine will always put a smile on your face :). How many other Heartwarming authors can you name in the pic? Anna J Stewart and Amy Vastine. Can you tell from all these photos how much we love each other? This is why we call ourselves the Heartwarming Sisters ;)! 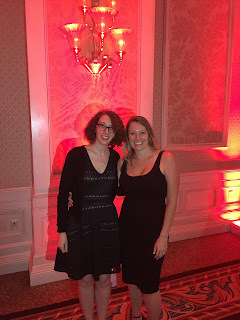 We haven't forgotten Heartwarming editor Dana Grimaldi! Her pics are coming up with many more! 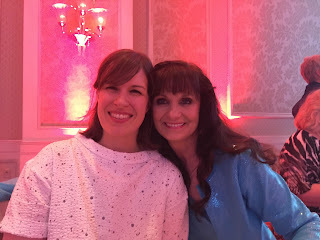 Anna Stewart and Cari Lynn Webb signed for Heartwarming at the big Harlequin Book Signing and they were a hit! Here are some pics from that event. Oh, and Rula was interviewed by the Harlequin camera team for their Youtube channel. One of the questions asked was what kind of woman reads romance. Guess you'll have to wait and see if they post the clip soon! Carol Ross and Kathryn Lye at the Harlequin Signing. 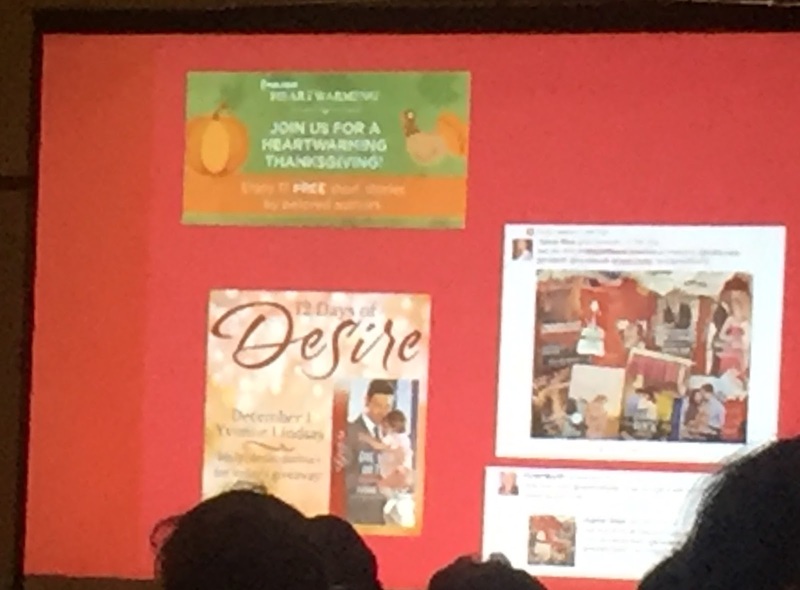 Yes, we have a lot of Harlequin Party pics coming up, but first, just to prove we went to workshops and Harlequin sessions, here are a few slides that caught our eye. These were from the Harlequin Series session. Notice that the really cute guy in the middle is on the cover of a Harlequin Heartwarming book? Great looking Heartwarming Hero. Thank you very much. Let's just linger here a minute ;). Yep, that's our very own Beth Carpenter on the upper right! 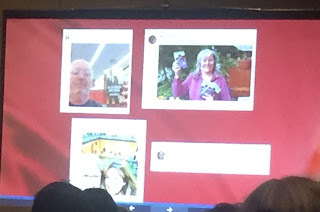 Her #MakeadatewithHarlequin photo was included in the slide show! We were excited to see her up there. We were also excited to see our A Heartwarming Thanksgiving promo banner on a slide! 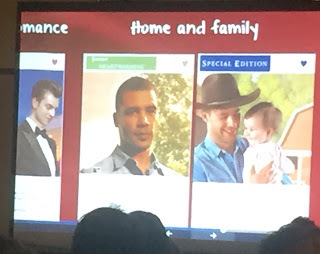 Oh and at one point, the audience was asked what their favorite Harlequin line was. 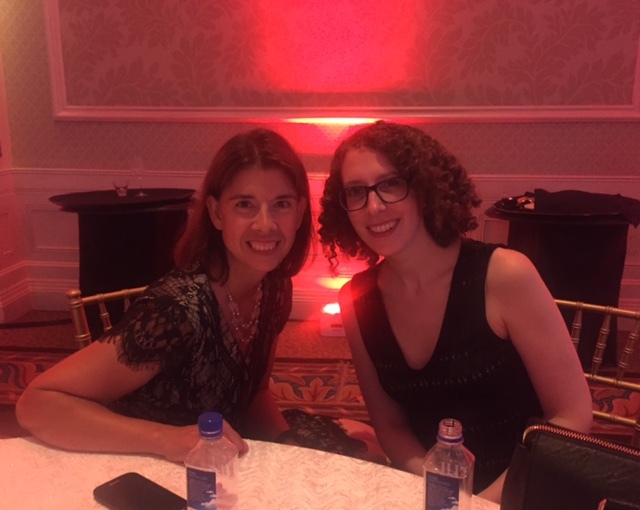 A lady sitting a few rows in front of us (we had a few Heartwarming authors towards the back of the room) was called upon and guess what she said? Heartwarming!!! We couldn't help but cheer from the back (loud enough to draw attention...oops)! But, come on, everyone knows we Heartwarmers love our line (and our readers:)! Now there's a reason for this next, sunny scenery pic. Gorgeous, right? But notice the clouds coming in? 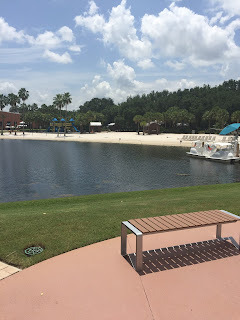 Man made beach at the Swan and Dolphin Resort. There was a pool there too and rumor has it that some ducks decided to go swimming with Kate! Will she confirm or deny? So those clouds... A massive thunderstorm blew through right when Catherine and Kate were headed between hotels to eat dinner before the Harlequin Party. To say they got soaked is an understatement! They had to sit in the restaurant dripping wet and were still soaked at the end of their meal. They cleaned up quite well though. 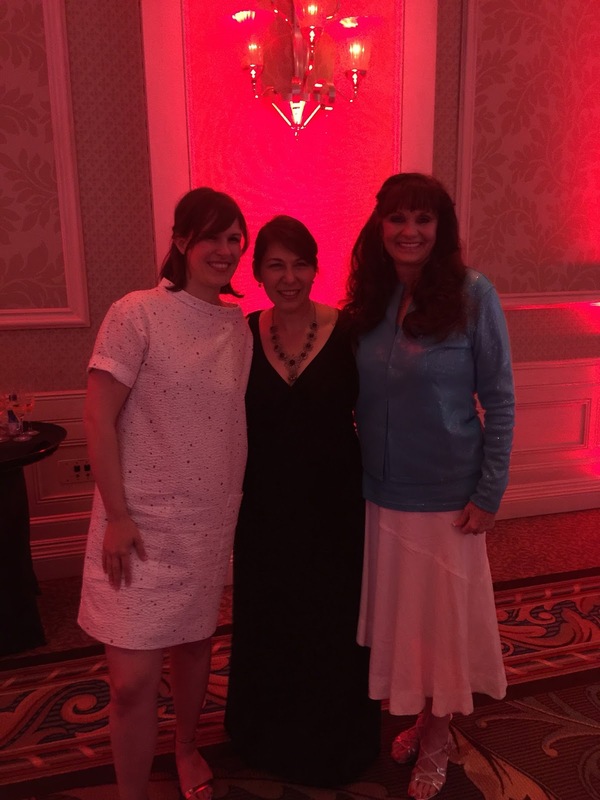 Just take a look at these Harlequin party pics and see! All set for the Harlequin Party! 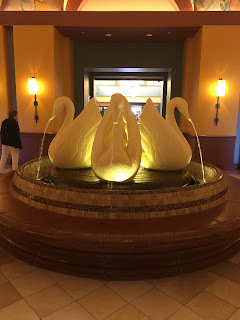 Swan fountain at the Swan hotel...but we're headed to the Waldorf Astoria for the party. Let's go! This clock is in the Waldorf Astoria's foyer and Catherine really wanted to take it home. Harlequin always provides dancing booties/socks at their party and it's a souvenir we look forward to. Most of us love wearing them while we type stories on a cold day or night. Well, they're a different color every year and this year they were turquoise...and just happened to match Catherine's outfit! Catherine grabbing a pair of Harlequin dancing socks. We'll let you devour the next photos. There simply are no words for the Harlequin Party. Pardon the pink hues in the pics. It was the mood lighting and a camera thing. It's all about the DJ and dancing! It's also about the awards! And we had some friends/sisters on that list! 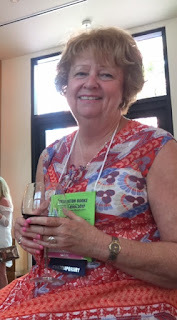 Congrats to Jeannie Watt on her 25th book for Harlequin! And congrats to Joanne Rock (Karen Rock's sister-in-law) on her 75th book for Harlequin! Fabulous and sweet Harlequin Author Concierge, who we can't live without, Miranda Indrigo...and Rula. 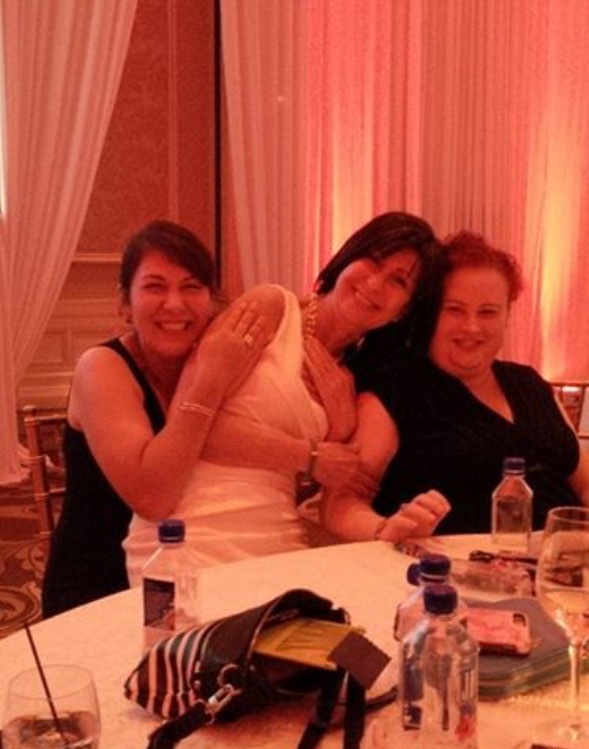 Yes, we tend to congregate at a table before we hit the dance floor. Jennifer Snow and Kate James modeling our Harlequin dancing socks. Want to see everyone dancing on video? Kate James posted some fun clips on Facebook! Another shot with our super fine, cool editor who, by the way, can really dance! No end to her talents! Harlequin always has a fun photo booth with accessories. This pic of Catherine and Kate is too cute! And did we mention the jumbo screens that scroll through Harlequin book covers at the party? Cari was on the dance floor! And Syndi, you weren't there, but we had your back girl! Here's your cover on the big screen! Amy, Jen, Carol and Rula at the 2017 Harlequin Party. Does this pic look familiar? Here we are back in 2014! Both pics are courtesy of Amy's camera and creativity! Feel free to tell us we haven't aged a bit ;). Writing keeps us young (cough, cough). 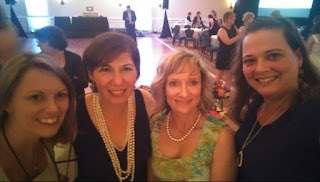 Jen, Rula, Carol and Amy at the 2014 Harlequin Party. 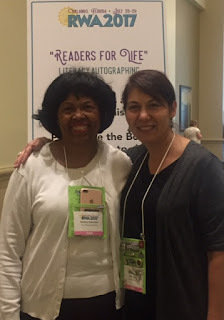 And after all the partying, we had more workshops and finally, there was the famous RWA Reader's for Life Literacy Autographing open to the public with the goal of raising funds for literacy. The lovely Shirley Hailstock and Rula outside the Autographing. Those of you who hang out on the Harlequin forums know moderator 'Dream' is Danica Favorite, Love Inspired author. A view of just part of the room to give you an idea of how many people come to this event to get author autographs and help raise funds for literacy. This little guy was between the two hotels. And that's all folks! We apologize to anyone who was there but didn't find their picture here. We simply didn't have it and we still love seeing you at RWA. 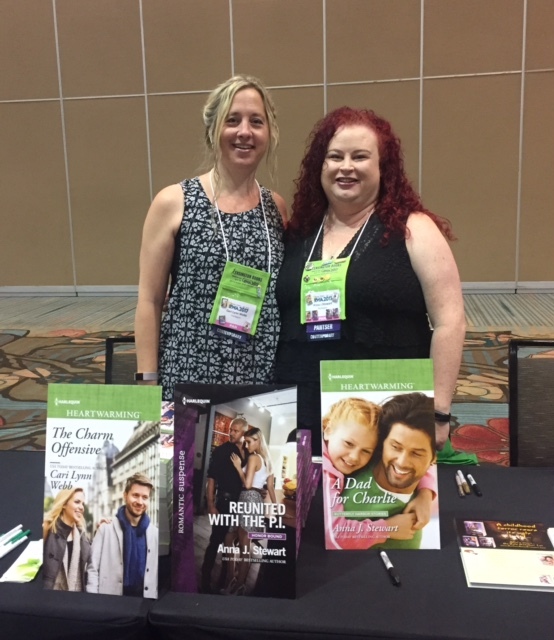 But for those of you who want to see more, check out #RWA17 on Twitter or like us on Facebook and you might find other pics or videos there. 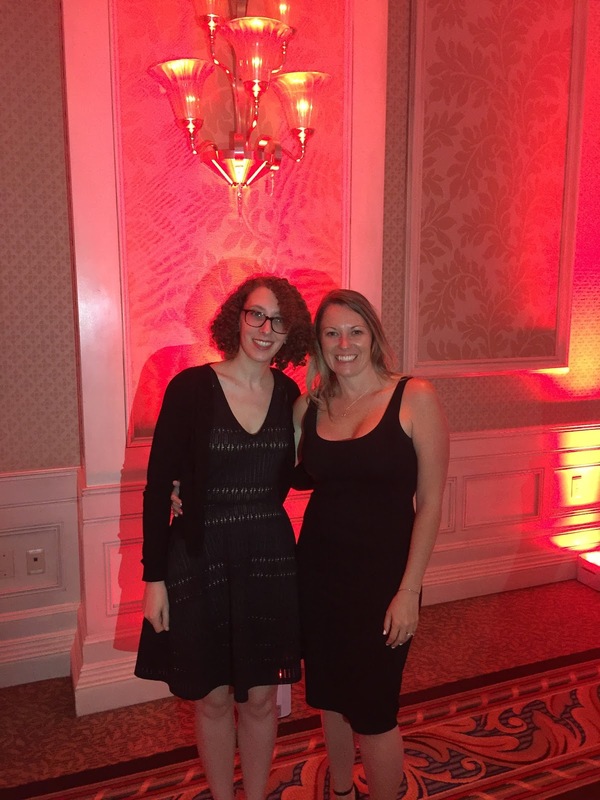 We obviously had a great time this year and we learned a lot about writing and publishing (topics for another post). We also made memories and cherished the time we got to spend with friends, fellow writers and readers who understand why we can't resist a great story or book. With all of these wonderful photographs, I feel like I was there. Thanks for sharing, ladies! Glad you enjoyed the pics, Jill!! Thanks, Jill! Can you tell we spent a LOT of time with our IPhones glued to our foreheads practically. There was so much going on and our Heartwarming sisters are the ultimate best. I miss everyone already! Yes, our iphones were like a jewelry accessory lol! 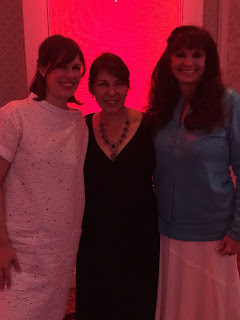 It was wonderful spending time with you two ladies and all the other Heartwarming authors and editors. Yes, it's true . . . I was swimming with ducks. Despite the little sign posted at ground level by the pool that the ducks aren't supposed to swim in the pool, they didn't seem to heed it and jumped right in! Thank you for the fun post! I'm looking forward to next year! They just couldn't let you have all the fun lol! 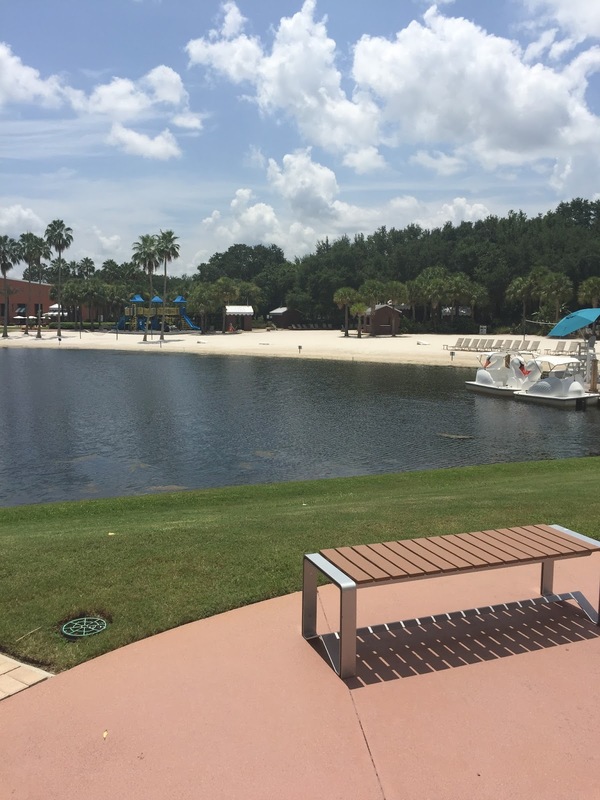 Only a Canadian would have liked that hot, hot Florida sun! Just kidding. It was wonder-filled...every moment. And so informative! LOL, yes, we could easily spot all the Canadian authors and editors because they were deliberately walking in the sun while the rest of us were hiding in the shade! Ha ha! Wow! 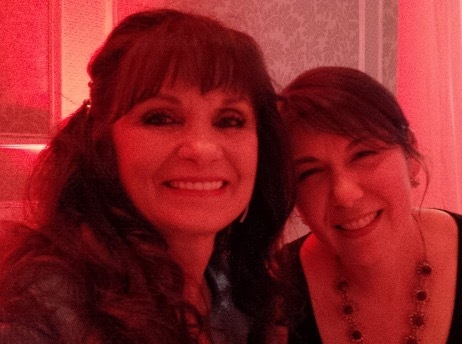 Thank you so much Catherine and Rula for the photos and highlights! A great way (if not the best...actually BEING there!) to enjoy the celebration of reading and writing romance. Looking forward to meeting all next year! Janice that would be so fun to see you next year! Thanks for showing us what the conference is like. Hope to see you next year! Really hoping you make it next year! I just love looking at the photos weeks and months later. So great. Thanks for stopping by to share with us. Awwhhh... Thanks so much, Ladies! You made me feel like I was right back there again. Such a fabulous conference. I miss everyone already. Same here! Missing you all! Isn't that the truth, Carol? Honestly, I felt like we rushed from session to session, never getting enough to eat...on my end, anyway...and by the time we shared what we heard, it was on to the next party. Darn the bad luck. Pun! 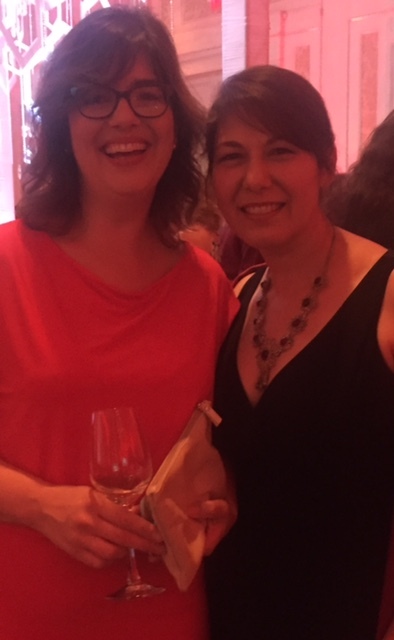 It was so great to see you too, Cathryn!! Glad you liked them, Sandra! We know not everyone can make it to conference for a multitude of reasons, which is why we love bringing the conference to you ;)! The photos are the best part. Last year, I downloaded a couple of my favorites and put them up on my mirror over my chest of drawers. Seriously, I get up every morning and say hello to all my Heartwarming Sisters. You all mean that much to me! Aw, we love you, Catherine! And I have to add, Victoria Curran, if you see this, we all really, really missed seeing you this year! Wish you were there! Thank you, Rula! Ditto, Victoria...so how's this? We fly up to see you! I'm in! And we should each take her another kitten as a gift lol (she can name them after us ;) lol. LOVE those pics! Thank you so much for putting it all together, Catherine and Rula. Eleven years a RWA member and I've not yet gone to a conference. Next year, I'm coming to Denver! It IS amazing how the years slip by. And it isn't easy to get away to go for so many of us. I had a LOT of those years when I could not attend. So, I get it. Great update with photos you ladies. Those of us who couldn't go this year missed so much. Hope I can get to Denver. We really missed you this year, Roz. But next year...I'm hoping it works out for Denver as well. We hope you'll be in Denver too! It would be so great to see you again, Roz! 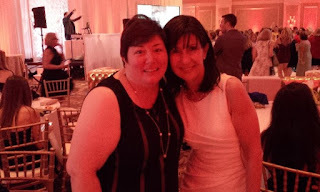 Love you back, Amy, and we definitely have to take that pic every year! Love you, awesome, Amy. That's my nickname for Amy, everyone. She really is awesome. And that incandescent smile of hers....who wouldn't want to hang with her? We had fun. Too bad there are so many sessions and meetings to go to, right? Your photos make me want to go! Thanks for representing the Heartwarming line so well! One of these days we hope to see you there too! Our pleasure, Patricia! It was a struggle, but hey, somebody had to dance all night...(I left that to the young kids) and eat the fabulous deserts and drink champagne. See? Wanna go next year? I mean, seriously? Can you believe how many we had and Rula CULLED it down. It's embarrassing how many I still have. Our cell phones were our jewelry!!! I need a new cover for mine. Something much more upscale than my Walmart purchase. Which actually has served well, but.... Hmmmm. Okay. I have to go shop now. 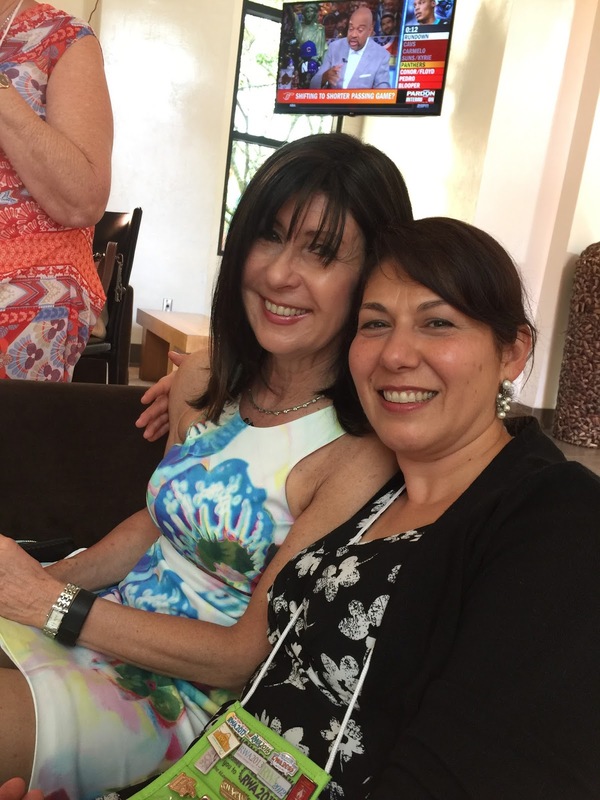 Rula & Catherine - wow! What a beautiful memory-making trip! I absolutely love the dancing socks! What a sweet idea and I love that everyone danced to "It's Raining Men" 🤣 Thank you so much for sharing! Hi Krissie! We all love those socks. They're my favorite thing to wear on cold winter nights. And we've had the same DJ at the Harlequin party for what seems like forever. He's great at picking out fun music to dance to! What was really fun was that the DJ jumped down from his podium/stage and danced with us! Talk about interaction. He was terrific. Think he's trying to impress one of us so we'll cast him as a hero in one of our books???? LOL, he's a great DJ and wouldn't that be a fun gift one year? For Harlequin to make a poster of a mock romance book cover with him on it as the hero ;). Wow! Now *that* is a blog post :-). 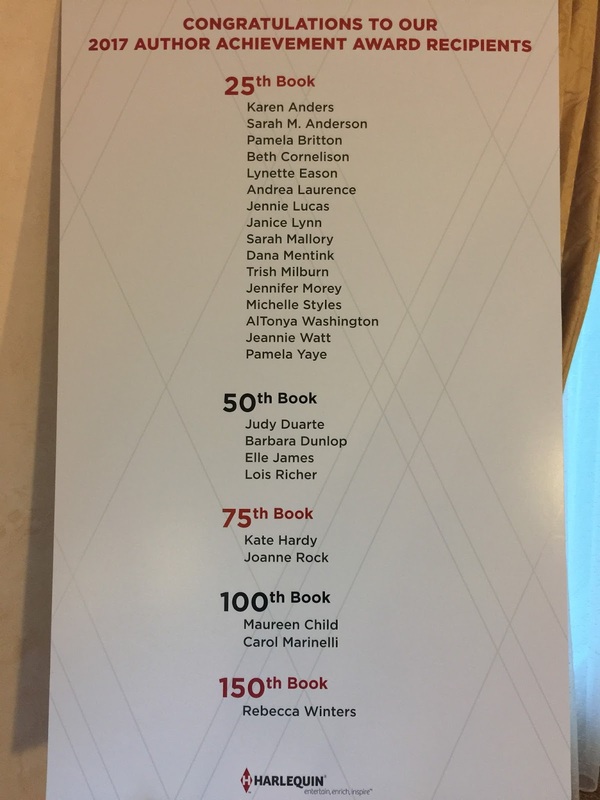 Thank you so much for including me and cheering with me on book #75. 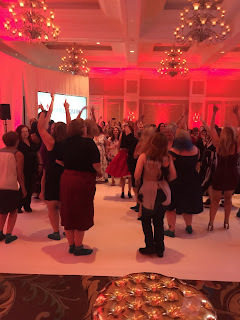 As you soak up the fun of a Harlequin party, you can see why I just won't quit writing romance... it's simply too much fun. And now that Karen is writing for Harlequin too, I've multiplied my friends many times over. I feel like a Heartwarmer by proxy. So nice getting to know all of you! Hey, Joanne! It was great seeing you at RWA and congrats again! Yes, you are an honorary Heartwarmer lol :). 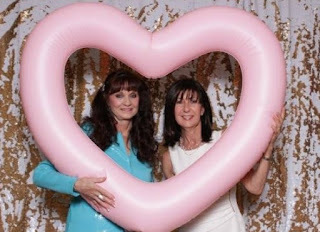 We love Karen and any 'sister' of hers is a sister of ours ;). Thanks for popping by! We're honored! Joanne, it was my pleasure to meet you and congratulate you. After 75 books, you need a vacation! Or a nap. And Karen is an absolute doll, and so are you. 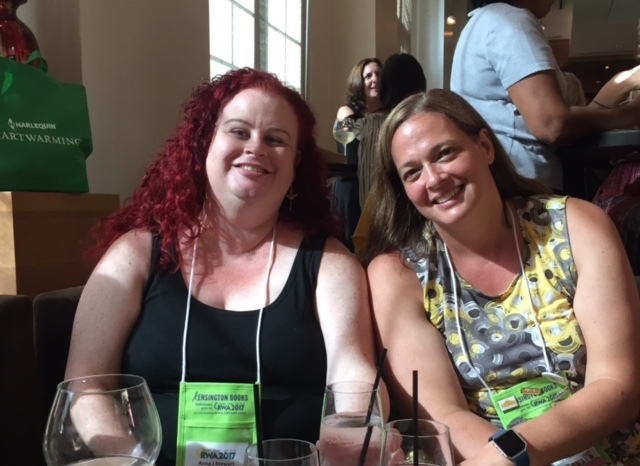 It is a blessing to have the chance to get to know one another at RWA. These friendships are so very precious to me. Heartwarmers are unique and caring ladies and we are thrilled to be related to you! Wow! What a bonanza post. Thanks for sharing these awesome pix. Hi, Leigh! Yep...Rula is right. It's a reunion on steroids...and no boring potato salad. Not that there's anything wrong with potato salad. What I loved were all the hugs. Lots and lots! Even some tears...happy ones...but tears. Love love loved all the photos and, oh, how I wish I'd been there. Next year is Denver. I'm penciling it in. You guys had a blast and it shows. All I can say is Harlequin Heartwarming Rocks! We're counting on you being there, Pam! HI, Pam! We missed you and you would have loved it. Everything this year was up beat. I think it was the best I've ever been to. Of course, the hotel complex and convention center felt like I was running a couple football fields and it was HOT outside, but wow, we crammed a lot in! This is so great!! I followed the posts on Facebook and could see how much everyone enjoyed themselves. Thanks for sharing with us. 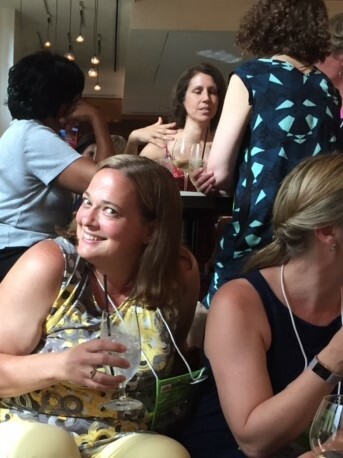 Laurie, it would be so awesome if one of these days it was somewhere you could attend...or even coordinate with a vacation so that you could meet us all or at least come to the Literacy autographing. I know we'd all love to meet you in person! :) In the meantime, so glad you enjoyed the recaps! A day late because I'm traveling, but I wanted to say I LOVE these photos. Thanks for sharing. You're welcome, Beth! Glad you enjoyed!